Home / animals / mountains / skiing / snow activities / A Camouflaged Snow Leopard Gave These Skiers The FRIGHT Of Their Lives. 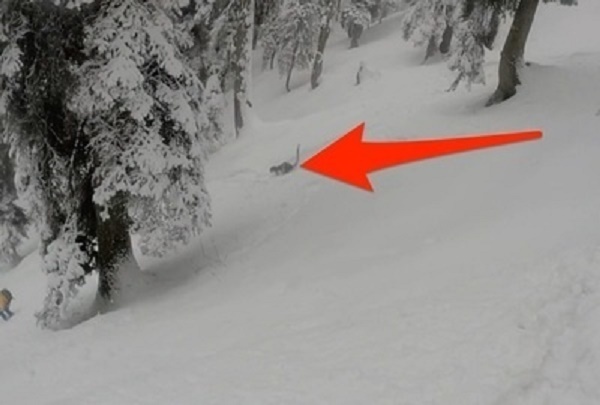 A Camouflaged Snow Leopard Gave These Skiers The FRIGHT Of Their Lives. A group of skiers had quite the scare as they skied down a mountain in Gulmarg, in the northern state of Jammy and Kashmir. Owen Lansbury from Australia filmed the surprising and tense encounter with a snow leopard. American tour guide, Dave Marchi almost ran over the animal who was camouflaged by the snow. In the video, you can hear a woman telling Lansbury to stop skiing. The peaceful stand-off didn’t last long. “I stopped just as it huddled in the snow, where it stayed for about a minute checking us out,” says the 42-year-old. These Skiers Turned The Streets Of Boston Into An Insane Ski Park. They Ski Down Something Most People Stay AWAY From… And The Footage Is Truly Scary. Professional Skier Straps A GoPro To His Helmet. What Happens Next Will Leave You Amazed.